Since the spread of classical design and construction amongst the upper echolons of British society in the late seventeenth century, traditional construction methods have largely fallen by the wayside. Centuries later, as the construction industry faces up to its environmental responsibilities, this book explores its rich and ancient tradition to provide tried and trusted solutions to modern day construction problems. By way of introduction, the ancient and historical lifestyles that dictated the nature of traditional construction are explored, before focussing on its health and ecological benefits. As well as cultural background, this book includes a detailed scientific description of traditional building materials and their constituents which draws a sharp contrast with modern petrochemical-based materials. The studies of traditional buildings included reveal the sustainability of features such as natural ventilation and breathing walls, and comparisons with modern construction methods show how they could prevent 'sick building syndrome'. 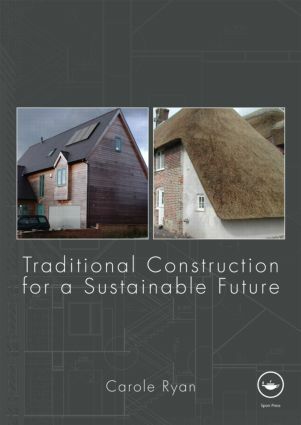 The author argues that maintenance for long life, by contrast with the modern concept of life-cycle costing, is at the nub of sustainability and underlies the contribution traditional building construction can make to tackling climate change. Over 250 original photos, and over fifty bespoke diagrams illustrate the features, techniques, and characteristics of traditional construction that could make such a valuable contribution to the industry today. The inclusion of a close study of how these methods relate to British building regulations makes this book a practical guide for construction professionals, as well as an authoritative resource for students and policy-makers.